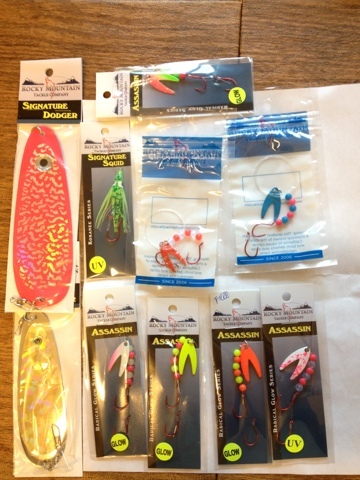 What are your favorite lures for salmon fishing? I am far from a salmon fishing expert, but I love chasing Kokanee salmon in the Colorado reservoirs that have them. I've posted a little about it before Here. I typically troll these behind lead core line and downriggers depending on the depths I'm fishing. My most productive colors in order have been pink, orange, chartreuse and green. For this trip I'm adding a few new variations to try. What are your favorite salmon lures? Let me know in the comment section below. Here is a video I added while I was down at Blue Mesa Reservoir. It adds some additional info about the lures and methods we were using. This is a short (just over a minute) timelapse from a camping trip next to Cottonwood Creek, which is near Buena Vista, Colorado. I shot it with a GoPro HD Hero 2 set to to take pictures at one second intervals. I don't have an LCD back or wireless transmitter for the GoPro, so I would take a picture, pull out the card and put it into my Canon 60D to view the photo. Then I would make adjustments and do it again.